Fourteen months ago. At Stockgen, Lindsey and Chet inject a mutagen compound into Specimen 6 (a very aggressive snapping turtle). Lindsey asks how Chet managed to get a blood sample from Hob in order to recreate the mutagen and he reveals that he simply drugged the alley cat’s food. Thirteen months ago. The snapping turtle has grown extremely large and now preys on rats for food. Chet tells Baxter Stockman that the lower intensity mutagen has slowed Specimen 6’s growth rate, allowing them more time to apply psy-control programming. Stockman intends for Specimen 6 to hunt down the Turtles for him. Nine months ago. A group of security guards struggle to control the now fully grown, anthropomorphic Specimen 6. 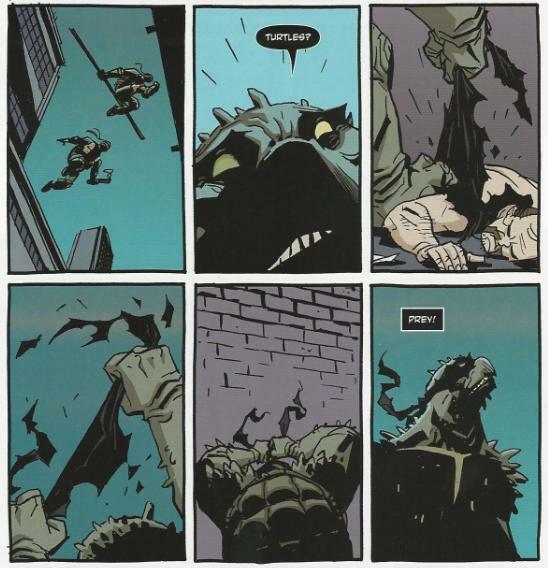 A rampaging, hulking brute, the snapping turtle takes down the whole set of guards before being rendered unconscious with a taser. One of the guards asks Chet why they can’t get Specimen 6 under control, as this isn’t the first time he’s gone on a rampage. 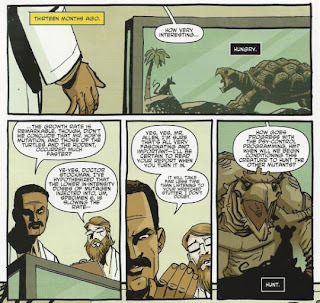 Chet explains that the psy-control manipulation is working, in that it is reducing the turtle’s intelligence, but it hasn’t yet synchronized with his growth, causing the turtle to go nuts. Two weeks ago. Specimen 6 escapes from Stockgen. Last night. Mikey stops by the pizza place to pay Woody a visit and pick up some grub. Mikey’s still distressed over Splinter’s decree that he and his brothers will have to use lethal force to stop the Shredder. Woody tells him that he’s a good guy and that he needs to listen to his heart; everything will find a way to work out. As Mikey leaves, Woody thinks he hears a noise by a dumpster. Specimen 6 bursts out of the garbage and attacks him. Now. From a rooftop, the Turtles observe another disaster area left behind by the mysterious “reptile monster” that’s been plaguing the city for weeks. The cops are scared and the Turtles are anxious, as they fear the cops will blame them for the destruction. Leo thinks that’s all the more reason to get out of April’s shop and return to the sewers. Don says he’s found a forgotten Cold War bomb shelter on some city maps that’s been gathering dust beneath an abandoned church and suggests they go check it out. Raph reluctantly agrees, but only if Don promises to get them home in time for Casey’s hockey game. Casey’s finally gotten his grades up enough to play again and Raph wants to be there to cheer him on. At the shop, Splinter is preparing dinner while Casey checks out the news on TV. Due to the huge slash marks left behind at the scene of each crime, the media has dubbed the monster “Slash”. Last night, the creature attacked a pizza boy, though he was rushed to the hospital and only suffered minor wounds. Suddenly, April comes storming in and tells Casey to take a look at her van. He checks it out and sees four huge slash marks on the side. April reminds him that the monster escaped from Stockgen the night she snuck in and stole the turtle-tracker and she thinks the creature may be hunting the Turtles. Speaking of the Turtles, they’re busy saving an old man from a pair of thugs. The old man is less than grateful, however, mistaking the Turtles for Slash. As the Turtles head back on course for the old church, they fail to notice Slash stalking them from the shadows. Getting a glimpse of his prey, Slash tears off a strip of black cloth from the unconscious mugger’s shirt and ties it around his eyes like a bandana. At the old church, the Turtles find the bomb shelter and are impressed with how elaborate the layout is. It even goes down four or five levels and connects with the sewer. The Turtles head down to the sewer access tunnel, where it’s pitch black. Slash sneaks up on them, breaking their flashlights. Caught off guard, the Turtles struggle to defend themselves from the berserk creature, but nothing they do seems to hurt it. Finally, Mike gets his flashlight back and shines it on Slash, only to see the lumbering snapping turtle standing atop the beaten bodies of Raph and Don and gripping Leo in his claw. 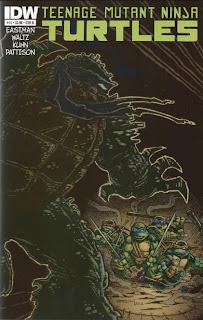 *This story is continued from TMNT Microseries #7: April. 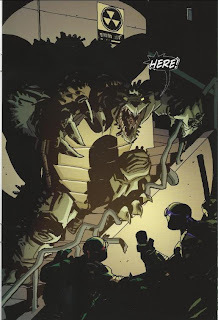 The story continues in TMNT (IDW) #16. *Slash was freed from Stockgen by April (inadvertently) in TMNT Microseries #7: April. *Woody last appeared in TMNT (IDW) #7. *This issue was originally published with 3 variant covers: Cover A by Kuhn, Cover B by Eastman and Pattison, and Cover RI by Kagan McLeod. Man, I can hardly contain myself. Slash. Oh, hellllllll yeah. The origin Waltz crafts for the Evil Mutant Turtle (formerly from Dimension X) fits him snugly into the new mythology he and Eastman have been crafting for the past year and some change. As much as I liked his old Archie origin, the fact that there just happened to be a planet populated entirely by anthropomorphic turtles that wore bandanas, belts and elbow/knee pads was sort of stretching things a bit. The idea that Stockman would endeavor to recreate the mutation that resulted in the Turtles certainly makes sense. I mean, if you have an endless supply of mutagen to make an army of monsters, why would you ever stop? Just one of the things that always sort of bugged me about the old Fred Wolf cartoon when I was a kid; that the Shredder more or less quit making mutant henchmen after Bebop and Rocksteady. Most of the other mutants in the show, even Slash, were an accident, and the ones he DID create (Groundchuck, Dirtbag and the punk Frogs) all turned on him in under 20 minutes. Of course, Slash worked out for Stockman about as well as any of the mutants Shredder made in the Fred Wolf cartoon, so perhaps building an army of monster henchmen ISN’T such a good idea, thinking about it. What’s nice is that there’s a reason for everything Slash does in this issue. He’s stupid because Stockman wanted a mutant he could control. He’s after the Turtles because he was created for the purpose of hunting them down. He loves his palm tree because he had one in his terrarium. He wears a black bandana because he saw the Turtles wearing them. And he’s called “Slash” by the media because of the huge slash marks he leaves behind. Nope, no convenient “he’s from a planet where everyone looks and dresses like the Ninja Turtles” cop-out, here. Waltz also brings in one of my favorite bits of modern Splinter characterization: His love of soap operas. I think the 4Kids show actually invented that character trait, but I’m rather glad it’s stuck. As the wise sensei and zen guru, the old rat can get pretty boring; I like the idea of him having at least one bizarre character quirk. And in relation to the IDW mythology, it shows that Hamato Yoshi has embraced an aspect of modern culture and technology, rather than living in a dojo, burning incense and pretending it’s still Feudal times. I’m still struggling with my love-hate appraisal of Andy Kuhn’s style. I still hate his Turtle faces, but I love everything else. Admittedly, with the prolonged beak, his Slash actually looks more like Tokka, but that isn’t much of a complaint, as his Slash looks SICK. The big splash on page 19, where Don shines his flashlight and finally reveals the monster in all its glory… Amazing. Ronda Pattison deserves serious credit, too, particularly for the fight scene; really using the glow effect of the flashlight to create a horror movie atmosphere (and perfect timing, too, as this issue came out on Halloween). As I think about it, I rather like the idea of fusing the characters of Tokka and Slash together into a single Evil Turtle entity. I don’t believe Slash was ever a snapping turtle in any of his previous appearances, and being a snapping turtle was really the only thing that made Tokka distinct over Slash (well, aside from somehow being LESS intelligent than the other Evil Turtle, which is saying something). Having both Slash and Tokka around together would seem a tad redundant, so combining them is sort of the best of both worlds. I guess all we need now is Rahzar. Anyhow, the only other thing I have to say is screw you, Leo. Salty, wok-cooked vegetables over rice are awesome. They’re sort of the only thing I know how to make, but still.